Everest Base Camp Trek is the most desired trek by the trekkers among many other trekking destinations in Nepal. A visit to Mount Everest is the lifetime dream of many people around the world. 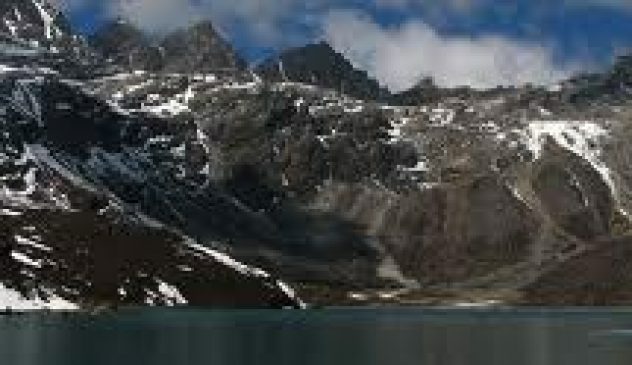 Being the ideal chance to provide the view majestic mountain and the splendid beauty of the region’s scenery, this trek takes its position in the top rank among trekking on the world stage. The trail has many ups and downs into its way through lush low land and alpine forest, Buddhist monasteries and authentic Sherpa Villages. This trek provides an opportunity to explore the lifestyle of the Himalayan people, their religion, customs and traditions. Also, rare birds like the golden eagle, snow pigeon, Red-billed and yellow-billed choughs as well as flowers like rhododendron, magnolias, blue pine, chir pine, juniper and hemlock are the main attraction. It makes the trekking a delight and amazing for nature lovers. Everest Base Camp Trek involves a high amount of ups and downs while walking. Teahouse trekking is also possible on the main trail to Everest Base Camp. The visit to Everest Base Camp is also the goal for many trekkers. But the view of Everest itself from the base camp can be disappointing; for the best views of Everest, we recommend taking the Kalapatter Trek. This trek can be completed by combining with the Everest Base Camp Trek. Day 15: Departure home . Upon arrival, you will be greeted by our friendly representatives and transferred to you in the hotel at Thamel Thamel is tourist hub place. an evening follows welcome dinner by GHZ (Golden Himalayan Zone). After breakfast, depart for a cultural and historical city tour in Kathmandu valley. – Showyambhunath Temple – (For eyes temple), a hilltop temple in the middle of the Kathmandu valley. – The Great Bouddhanath Stupa, one of the biggest stupa in the world. Its four pairs of eyes in the four cardinal directions is keeping watch for righteous behavior and human prosperity. – Kathmandu Durbar Square, former kingdom. We take an early morning domestic flight to Lukla which is where all Everest region treks begin. We meet the rest of our team in Lukla and start trekking from there. We walk on a trail that gradually descends to Cheplung village from where we get a glimpse of Mt. 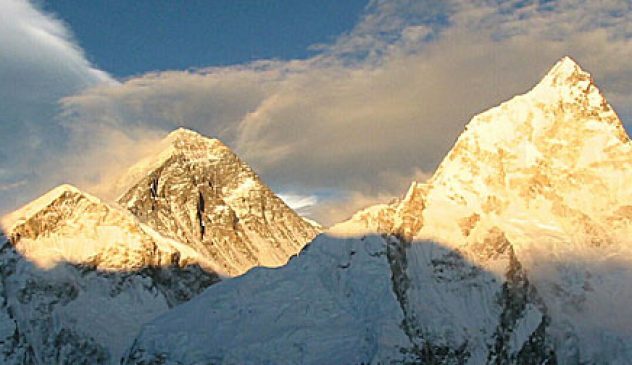 Khumbila, a sacred mountain which has never been climbed. From here, we gradually descend until Phakding. Overnight in Phakding guest house. After breakfast at the guest house, our trail passes through a pine forest and we continue our walk on the trail that goes north up the Benkar valley. We cross Dudh Koshi River and pass Chumoa and Monjo villages before reaching the entrance of the Everest National Park. Then after crossing a suspension bridge, we pass Jorsale village and walk alongside the Dudh Koshi and Bhote Koshi rivers. We ascend on a steep trail and reach Namche Bazaar which is probably the biggest sherpa community town in the Everest region. Overnight in Namche Bazaar. 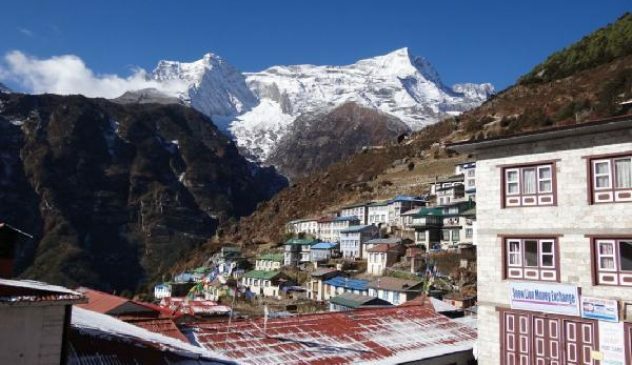 We can tour Namche Bazaar which is the primary town of the Everest or Khumbu region and has government offices, ATMs, internet cafes, shops, restaurants, pub bar and a colorful market. We can hike-up to Sagarmatha National Park and enjoy the sunrise over the Himalayas including Mt. Everest, Lhotse, Nuptse, Ama Dablam, Thamserku, Kongde and so on. If we are interested in a day hike, we can trek to Khumjung village. Overnight in Namche Bazaar. From here we ascend towards Tengboche village which houses the very famous Tengboche monastery which is the biggest monastery of the Everest region. It is located within the Sagarmatha National Park which is a UNESCO World Heritage Site. The monastery is blessed with panoramic views of the Himalayas, including Mt. Everest, Nuptse, Lhotse, Ama Dablam and Thamserku. Overnight in Tengboche. Our trail descends and passes through lush forests of birch, confer and rhododendron trees. While trekking we can admire good views of Mt. Everest, Ama Dablam and Lhotse. We walk downhill to Debuche and cross the Imja River to reach Pangboche. We choose the upper Pangboche trail and admire the Himalayan vista and the Pangboche Monastery. We continue our walk to the Imja Valley and Lobuche River before ascending to Dingboche. It is a picturesque village with beautiful barley, potato and buckwheat field complete with grazing animals dotted along those fields. Overnight at Dingboche. The top of the ridge is filled with prayer flags and stones which are memorial shrines for climbers who lost their lives on Mt. Everest. we find ourselves facing several great peaks. Overnight at Lobuche. There is also a lot of meandering on rough terrains. As we reach the base camp, we enjoy the incredible melt patterns and admire the gently rounded ice towers on the upper part of the Khumbu glacier. The Everest Base Camp is stunningly beautiful. We can enjoy amazing views of Nuptse, Khumbuste and Pumori mountains from the base camp. After soaking in the beauty, we walk back towards Gorak Shep where we spend the night. Overnight in Gorak Shep. We wake up early for the walk up to Kala Patthar. It is dark outside with cold temperature and most likely chilly winds. We walk on a fairly steep trail at a comfortable pace. As we are climbing up the hill we can see Lingtren, Khumbutse, and Changtse mountains. The view from the summit is outstanding. We can see the world’s tallest mountain Everest along with other mighty Himalayan peaks. After spending some time at the summit of Kala Patthar, we walk back to Gorak Shep which is relatively easier than hiking up to Kala Patthar. After returning to Gorak Shep, will have lunch ta the same hotel. After lunch, we descend to Pheriche to spend the night. Overnight in Pheriche. We lose approximately 2,000 feet in elevation today and walk on a trail with a lot of ups and downs. We descend through a hillside filled with rhododendron, Himalayan juniper trees and cross a bridge over the Dudh Koshi River. We descend rapidly through a pine forest where we can easily spot mountains goats, pheasants and other wild animals and birds common to the area. 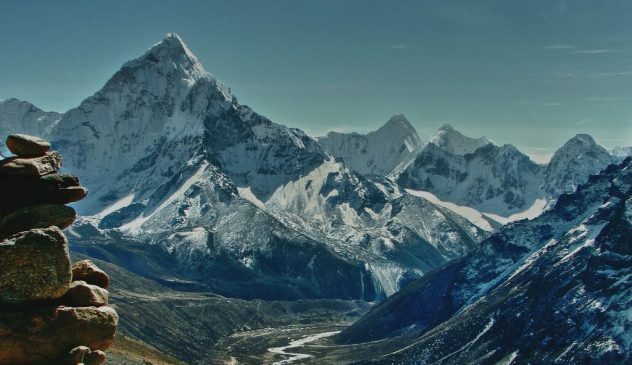 The path eventually reaches Sansa from where we can enjoy views of Ama Dablam, Thamserku and Nuptse mountains. We walk on winding trails followed by another walk through a forest before reaching Namche Bazaar. Overnight in Namche Bazaar. We begin our trek to Namche Bazaar today on rocky terrain. It is mostly a downhill trek on a trail alongside the Dudh Koshi River. We cross several suspension bridges, pass by several monasteries and villages before reaching Lukla. After reaching Lukla we spend rethe st of the day taking rest as today will be our last day on the mountains. so we can have enjoyed our last day in Lukla dancing, singing with guides and porters. Overnight in Lukla. after breakfast at Lukla we will take a domestic flight back to Kathmandu. overnight at hotel in Thamel. Day 14: Free and easy day for you to explore Kathmandu, relax and massage .